Today I cycled from Five Houses to Harmony Junction, fish ladder is near Harmony Junction. No water flowing at the Artisn well which is at Harmony Junction as well. Selkirk bridge is a short one. The sign showing the exit to Wood Islands, about 4 km distance. Golf today at the Strathgartney Highlands, I had a good game I finished with the same ball I started with. A view of the 9th hole, it has a dogleg to the left. 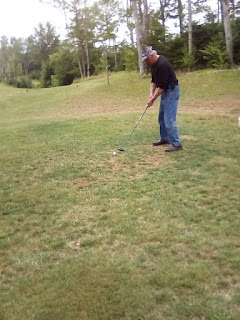 Buddy showing how to use the big iron. WE had 16 in the group this evening, we cycled to Suffolk and back the Sherwood road. Today I cycled Hampshire to Fredericton and back. A nice stand of Buckwheat just west of Fredericton. The trail parking lot at the Colville road just received a nice layer of crushed rock. Sunny at 21 with a light west wind, a good day for cycling. Today I cycled from Alberton to Tignish and return to Alberton. The story of the 1932 train wreck near Tignish. Tignish is the start of the Confederation trail, Mile zero. I cycled around the waterfront this morning, lots of boats at the marine. The harbour Hippo was touring the harbour. This evening I cycled from Winsloe to the Johnson road in Darlington. Today I cycled the trail from Bristol to Five Houses. Fishing boat was working the mussel lines in St Peters bay. East of Morell the is a nice stand of Milkweed, it was smelling nice today with so many blooms out. I was out in the morning so temp was around 25, later in the day it was 28 with a feels like 34. This evening we had 15 in the group, we cycled to Hampshire (marker 167) and back to the Sherwood road. Today I cycled from Fredericton to Kinkora. I met 11 other cyclists during the trip. Today I was in the Don Harris ride starting at Rossigal winery in Little Sands. I cycled to Wood Islands, this is the start of the Confederation trail. Only 66 km to Charlottetown. Central Queens United Church where there was a service of celebration in memory of the life of Elizabeth Ann Sovis who was killed 5 years ago by a motor vehicle. A ghost bike place at the scene of the collision on route 13 in Rennies road. We had about 15 in the group this evening, we cycled west to Pleasant Valley and returned to Hunter River. 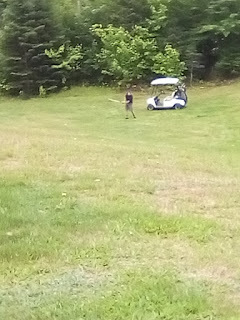 Golfing with a couple buddies, there were a few wild swings. WE had 16 cyclists this evening, we rode to the Suffolk road and back. This morning I cycled from Mount Stewart to the 48 road and back to Mount Stewart. This evening I cycled to Victoria park, a few boats out in the harbour. Also a couple out the mouth of the harbour. I then cycled to the trail at Grafton St and cycled the trail to Winsloe and the road home. This evening I cycled from Milton to Hunter River and back to Milton. 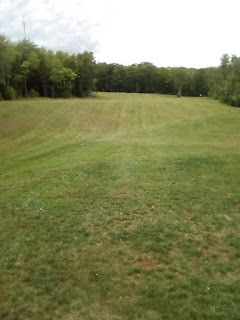 Photo is of grass area next to the parking area. It was overcast with a temp of 24. There looked to be a break in the clouds to the west but didn't show in the photo. Today I cycled from Miscouche to Northam, first photo is going though Richmond. I turned at marker 78 near the Northam road. Warm at 28 and sunny with a west wind gusting 40-50 km/h. This evening we cycled from Suffolk to Scotchfort and return, about 25 km for the trip. 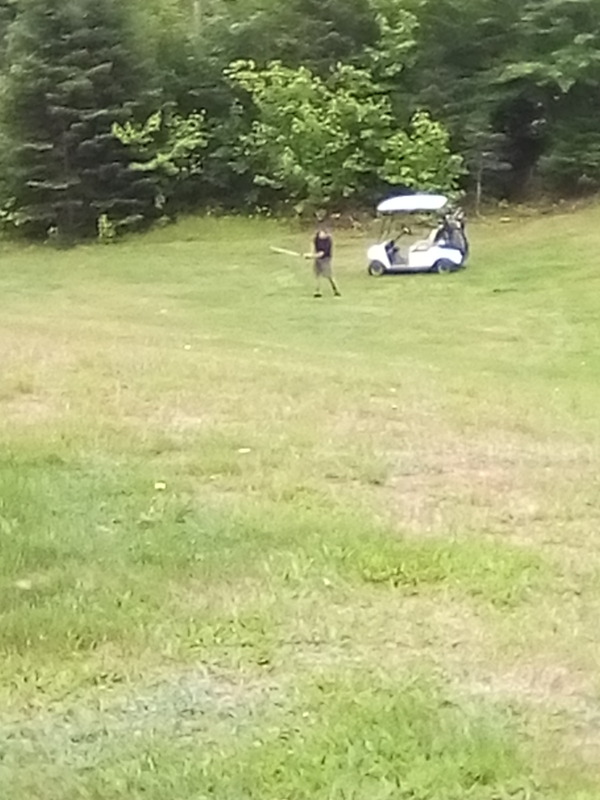 Yesterday I was on the golf course, my two buddies in the cart. 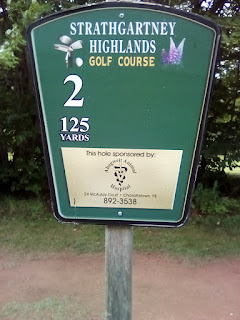 A view of the green on hole one. I cycled around the water front today, The "Charlottetown" was in port. And the Canada C3 as well, it will be sailing the Northwest passage.